In an earlier post, I pointed out that apart from Metro Gaisano located within Market! Market! and S&R Membership Shopping, there appears to be a dearth of groceries in Taguig. A few steps away from your doorway. A few pesos cheaper than your other supermarket. A few feet more elbow room. A few more choices than your typical grocery store. A few days fresher than your wet market vendor. A few rides more convenient. A few more smiles. A few more extra miles to serve you better. At Parco Supermarket, we don't like to toot our own horn. We're not a huge company or part of a conglomerate out to rule the world. We're a simple family-run business just trying to take a few extra steps to make your shopping experience a little less painful and a little more convenient. So look out your window. We're that little store around the corner. Come on over. You're always welcome here. I set out last Sunday to find out where exactly Parco is so I could check it out. The good news is, there's ample parking. The grocery is mid-sized, approximately the size of a typical Rustan's Expresslane grocery. Unlike Rustan's, however, it doesn't target the A-B crowd. However, it does have all the usual goods for everyday needs. Plus, the aisles are fairly wide and when I went last Sunday, it wasn't crowded. Maybe it's because it wasn't a payday weekend? It even has a fresh fruits, vegetables and meat section though the selection wasn't that extensive. This, together with the soon-to-open Puregold Taguig, will help serve Taguig's 613,343 residents (as of the 2007 census, so this should be way bigger now) so that Metro Gaisano Supermarket doesn't get too crowded, especially on weekends. I am, however, still holding out for an SM Hypermart/Waltermart-type grocery in OBGC (or Outside Bonifacio Global City) Taguig. C'mon guys, hurry up and set up shop here in Taguig! Here's the latest from the organizers of Cinemanila 2011 which will be held in Taguig City starting November 11, 2011. The 2011 Cinemanila International Film Festival, in cooperation with the City of Taguig, will pay tribute to one of the Philippines' most accomplished actresses, Nora Aunor (born Nora Cabaltera Villamayor on May 21, 1955 in Iriga City, Camarines Sur), by bestowing her with the Lifetime Achievement Award on 11 11 11, during the festival’s Opening Night. Aunor is popularly regarded as the Superstar for her stellar achievements and enormous contribution -- as actor, singer, TV host, and producer -- to the entertainment industry. As part of the homage to the multi-awarded Aunor, a short video tribute will be shown during the presentation of the award. And throughout the festival, Cinemanila will screen (with English subtitles) classic films showcasing Aunor's legendary acting talent, including Tatlong Taong Walang Diyos (1976), Minsa'y Isang Gamu-Gamo (1976), Bona (1980), and Himala (1982), winner in 2008 of the CNN APSA (Asia Pacific Screen Awards) Viewers Choice Award for Best Asia-Pacific Film of all Time. Indeed, Nora Aunor is a world-class artist as shown by the list of international organizations which gave her a Best Actress award, including the Cairo Film Festival (The Flor Contemplacion Story, 1995), East Asia Film and Television Festival (Bakit May Kahapon Pa?, 1997), Brussels Festival of Independent Films (Naglalayag, 2004). She was also nominated in the Berlin Film Festival for Himala and awarded the Certificate of Honor in the Cannes Film Festival for Bona. With the Cinemanila Lifetime Achievement Award, Aunor will join an exceptional group of individuals who received the same award, such as US filmmakers Quentin Tarantino (2007) and Paul Schrader (2009), Indonesian actress and filmmaker Christine Hakim (2003), film programmers Aruna Vasudev and Philip Cheah (2006), Pusan International Film Festival founding director Kim Dong Ho (2005), and fellow Filipino artists Vilma Santos (2003), Eddie Romero (2004) & Dolphy (2010). Aside from these personalities, other special guests who graced Cinemanila in the past include Jafar Panahi (The Circle, 2000) and Fernando Meirelles (City of God, 2002). The 2011 Cinemanila International Film Festival will be held from November 11 to 17, 2011 at the Market! Market! Cinemas in Bonifacio Global City in Taguig City. Around 50 international and local films will be screened in a span of 7 days, from the current toasts of the local indie scene to the award-winners and favorites of prestigious festivals such as Cannes, Berlin, Rotterdam, Sundance, and Pusan. The festival will also feature workshops, seminars, and master classes. For more info, or jpegs for a release, please contact cinemanila.press@gmail.com and cinemanila@gmail.com or go to www.cinemanila.org.ph. Did you know that Ate Guy has her own IMDB page? 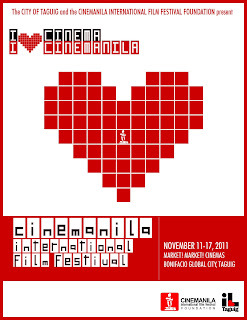 From November 11-17, 2011, Taguig will be hosting the 13th Cinemanila International Film Festival. Venue is at Market! Market! Cinemas, Bonifacio Global City. Among the highlights will be the conferment of a Lifetime Achievement Award to Nora Aunor. I will post more details as these become available. In the meantime, check out Cinemanila's website, Facebook page and follow it's twitter account @CinemanilaIFF. Haribon recently launched its Road to 2020 campaign, which "aims to plant native trees to restore 1 million hectares of forests in the Philippines by year 2020." For as little as Php 100 pesos, you can support Haribon's reforestation activities in, among others, the Caliraya Watershed in Laguna. For more details, go to Haribon's website, or, better yet, read Kay Malilong Isberto's blog, The Journey of Pure Light: How to adopt a seedling. Taguig City is divided into 2 districts. The 1st District is composed of Bagumbayan, Bambang, Calzada, Hagonoy, Ibayo-Tipas, Ligid-Tipas, Lower Bicutan, New Lower Bicutan, Napindan, Palingon, San Miguel, Santa Ana, Tuktukan, Ususan and Wawa. The elected Congressman for the 1st district is Arnel M. Cerafica. Do visit his profile from the website of the House of Representatives. He is apparently on his first term but has authored 3 bills and co-authored 40 other bills. Notably, he is pushing for the establishment of a district hospital for the 1st district. I've been living in Taguig for about a year and a half and the only hospital I know here is St. Luke's, which is inside Fort Bonifacio. So this should be a good thing, if the bill ever passes. As a resident of the 1st District, however, I have yet to hear or see of any project (of the pork barrel kind) from the good Congressman. Must research more. The 2nd District, on the other hand, is composed of Central Bicutan, Central Signal Village, Katuparan, Maharlika Village, North Daang Hari, North Signal Village, Pinagsama, South Daang Hari, South Signal Village, Tanyag, Upper Bicutan, Western Bicutan and Taguig's most famous and affluent barangay, Fort Bonifacio. The elected Congressman for the 2nd district is Sigfrido "Dante" R. Tinga, who was the former mayor of Taguig. His profile can be found here. While also on his first term, he has been busier than his counterpart in the 1st district, having already authored 23 bills. Notably, he is asking for the creation of 10 additional Regional Trial Courts for Taguig and 4 Metropolitan Trial Courts. He likewise appears to be positioning himself as a champion of local film and music industry, as seen by his bills proposing tax breaks and incentives for these groups. Recently, the Philippine Center for Investigative Journalism ("PCIJ") " deployed seven college student interns who filed requests for six major types of documents, including the asset disclosure records of the LGU officials, as well as the budget and development plans of the LGU. The audit also focused on documents pertaining to education, health, public safety, civil registry and property, and doing business." The subjects of the audit were the 17 local governments of Quezon City, Manila, Marikina, Paranaque, Pasay, Navotas, Malabon, Makati, Mandaluyong, Pasig, San Juan, Valenzuela, Las Pinas, Muntinlupa, Pateros, Caloocan and of course, Taguig. Political rivalry also got in the way of accessing documents in Taguig. Majority of the requests were denied there supposedly because the documents had to be kept “confidential” on account of an ongoing court case between Mayor Laarni Cayetano and her losing rival in the May 2010 elections, retired Supreme Court justice Dante Tinga. Only the documents from Taguig’s BPLO, the Assessor’s Office, and the City Health Department were provided. Requests filed with the Mayor’s Office, the Public Safety and Order Office (POSO), and the City Budget Office were not granted within the 15-working day deadline set in law. Here's the link to the full PCIJ report: Part 1 and Part 2. Fort Bonifacio, Makati City. Does that sound better to you? Did you know that Fort Bonifacio, among other barangays, is part of a bitter tug-of-war between Makati and Taguig? In 1993, Taguig filed an action for judicial confirmation of its territory and boundary limits against Makati, Teofisto P. Guingona in his capacity as Executive Secretary, Angel Alcala in his capacity as Secretary of the Department of Environment and Natural Resources, and Abelardo Palad, Jr. in his capacity as Director of the Land Management Bureau. The complaint was raffled to the Regional Trial Court (RTC) of Pasig, Branch 153, and was docketed as Civil Case No. 63896. Nearly twenty years and at least two Supreme Court cases (G.R. No. 163175, 27 June 2008 and G.R. No. 168781 14 September 2007) later, it appears that RTC-Pasig finally issued a decision. From the looks of things, it appears that it was in favor of Taguig. Now, Makati has asked the Court of Appeals to nullify said ruling, claiming, among others, that the decision was issued after Judge Briccio Ygana retired. 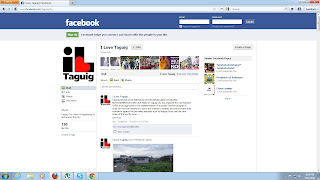 It looks like there is a new Facebook page for Taguig City, called I Love Taguig. It contains updates on the latest projects of Mayor Lani Cayetano. 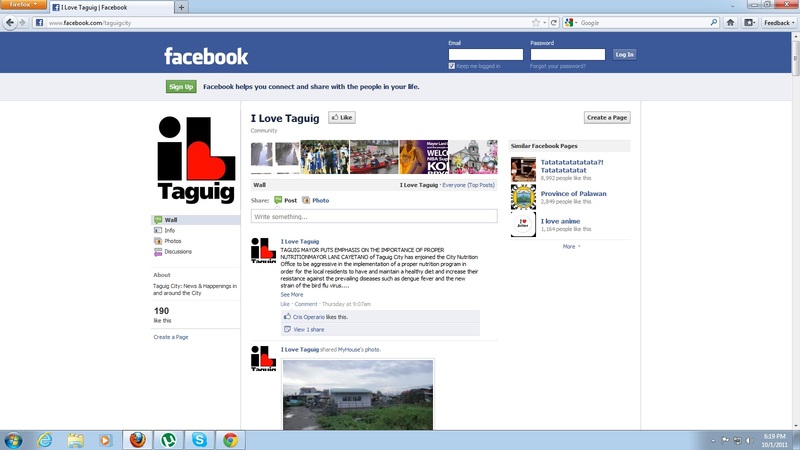 Maybe it can serve as an alternative, at least until the official Taguig website is up and running. Let's check it out! P.S. 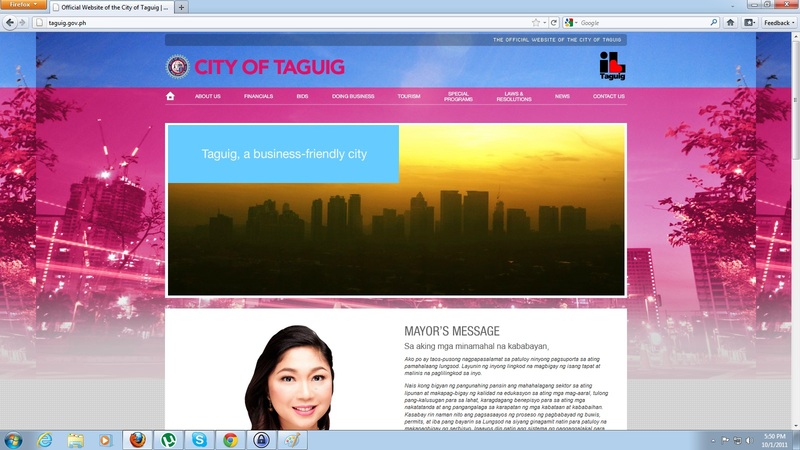 Mayor Lani, when do we get an official Taguig website? It would be nice to have the names and contact particulars of our mayor, vice-mayor, councilors, congressmen, barangay officials, and the hotlines of all the police and fire stations and government hospitals in Taguig. As you may well know, DMCI has a lot of projects all over Metro Manila. In Taguig, it has what it calls Acacia Estates - composed of 7 subdivisions: Rosewood Pointe, Royal Palm Residences and Cedar Crest, with mid-rise and high-rise buildings, Mahogany Place 1, 2 and 3 and Spring Lane Homes, with mostly single-detached homes and townhouses. There are also other projects outside Acacia Estates which are located nearby. DMCI projects have received generally good reviews from buyers and investors, specially with respect to build quality and timely turnover. However, its biggest challenge appears to be in property management which the company does not have any experience or expertise in. As a result, homeowners have gone to the internet - with a host of threads in various message boards as well as Facebook pages - in a bid to gain a sense of community and to try to improve the services being rendered by current property managers. See, for example, the Facebook page put up by residents of Riverfront Residences and Royal Palm Residences (both in Taguig) as well as threads dedicated to Dansalan Gardens and Tivoli Gardens (in Mandaluyong) over at skyscrapercity.com. This threads will give prospective buyers an idea of the frustrations currently being experienced by the residents of these communities. In addition, unlike its competitors Ayala Land. and Megaworld, DMCI's project do not normally have a commercial areas built in and are purely residential. In Taguig, for example, DMCI has so far refrained from building a mini-mall (similar to SM's Hypermart or Waltermart) within or just outside Acacia Estates, to take advantage of the growing number of residents in the area. I'm sure everyone has heard of the tragic death of a business woman in Taguig, who died after a grenade placed inside a gift box exploded while she was opening it. According to reports from the Inquirer, Taguig intends to set up a one-stop-shop for business permits. Based on said reports, the move is intended to encourage owners to comply with city government regulations in operating businesses by expediting the process. The one-stop-shop, which is set to open on 3 January 2011, will be located at the city's Auditorium.